Summary: Old Noah’s Elephants is a comical tale that focuses on the disobedient actions of the two elephants inside of Noah’s ark. Noah and his wife, Emzara spend their days busily looking after the animals on the ark. When the two elephants get into the food supply and try to eat it all up, they gain so much weight that the ark almost sinks. In an effort to save the ark and everyone in it, Noah turns to God in prayer, asking, “What should I do, God? We’ll perish if I can’t get the elephants to move.” God replies, “Tickle the hyena. Trust me.” Always obedient, Noah takes God’s advice and chaos ensues inside the ark. 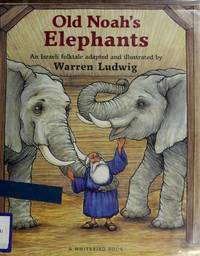 Literary elements at work in the story: Old Noah’s Elephants is an old Israeli folktale that has been adapted and illustrated by Warren Ludwig. It is a form of Midrash, which is an interpretation of a commentary on a biblical text. The story is written in prose and it is in the third person. This book offers its readers humorous insights into daily life on the ark, and it gives us a peek inside of Noah’s relationship with his wife. The illustrations are done in pen and ink and watercolor. The pictures are colorful and detailed, and they comically tell the story of Noah and the elephants for children who cannot yet read, or who like to look at the pictures while the book is being read aloud. How does the perspective on gender/race/culture/economics/ability make a difference to the story? Noah and his wife and family are living on the ark with the animals. Noah and his family are white. Theological Conversation Partners: Genesis 6-9. Listen to God and obey God’s laws and instructions—even when they do not seem to make sense. How is this story similar to the story of Noah and the ark in the Bible? How is it different? Show me your favorite picture. What is happening in this picture? God told Noah to “tickle the hyena.” Did Noah obey God even though he didn’t understand God? How do you feel when you obey? How do you feel when you disobey? Old Noah’s Elephants by Storypath is licensed under a Creative Commons Attribution-NonCommercial 4.0 International License.